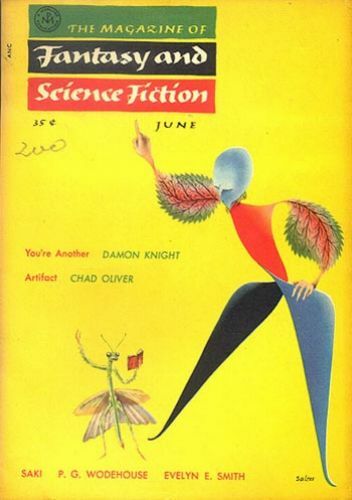 #‎TBT‬ to the June 1955 F&SF and this whimsical George Salter cover. The next story is “Created He Them” by Alice Eleanor Jones, who is described in the intro as a “scholar-turned-housewife.” Jones published a handful of pulp science fiction stories, all in 1955, before moving on to writing fiction for slicks like Ladies Home Journal and Redbook. Of those five genre stories, “Created He Them” is the most reprinted, appearing most recently in Justine Larbalestier’s Daughters of Earth: Feminist Science Fiction in the Twentieth Century. It’s a beautifully crafted, wrenching post-apocalyptic story of a bad marriage that functions as both social commentary and character study. The next new story in the issue is “The Adventure of the Ball of Nostradamus” by August Derleth and Mack Reynolds, part of a long-running science-fictional Sherlock Holmes series featuring the detective Solar Pons and his colleague Dr. Parker of Praed Street. “The Faithful Friend” by Evelyn K. Smith is both an alien invasion story and a bitter, moving meditation on the idea of freedom. After so much science fiction, the issue turns toward Appalachian fantasy with “Walk Like A Mountain,” a John the Balladeer story by Manly Wade Wellman. 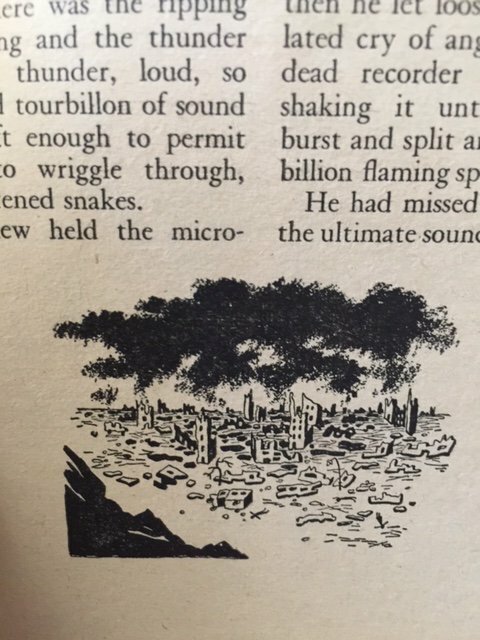 Charles Beaumont’s “The New Sound” is a wonderfully weird and offbeat story about a necroaudiophile. The story’s first paragraph begins with: “Of all the squirrels in a world full of squirrels Mr. Goodhew was by far the squirreliest.” …and ends like this: “He would listen to death at night. It made him very happy.” At the very end appears one of the magazine’s rare story illustrations (we’ll put it in the comments below). No artist is credited. The issue ends with “Artifact” by Chad Oliver, a professor of anthropology, who delivers a smart story about archeology and human history. Like many early issues of F&SF, this one also contains several reprints, in this case, stories by Saki, Willard Marsh, and P.G. Wodehouse. There’s also a poem by mystery writer Carlyn Coffin, Recommended Reading by Anthony Boucher, and a cartoon by New Yorker regular Corka. A pretty extraordinary issue and worth every penny of its 35 cent cover price!